The production of high-quality electronic products poses complex challenges, requiring top reliability and quality awareness of everyone in the production chain. With top personal commitment, unrivalled steady performance, carefully selected international manufacturers, state-of-the-art in-house production and a steady stream of novel ideas, wtronic has perfected its PCB and assembly products. Based on our technical competence, flexibility and personal commitment, we can offer our customers optimal electronic solutions accompanied by our leading and unique service competence. Innovative spirit, continuous further development and education, top quality standards and economic stability are at the core of our guarantee of certainty and reliability to our customers. A unique full service package for unique production standards. Certainty starts with good advice. Its competency in respect of every detail, international networking and solid familiarity with all relevant quality aspects render wtronic special. The right concept well in advance constitutes the groundwork for cost-effective and stable end products with a long service life. Many unique products and processes are characterised by ideas and vision. wtronic relies on state-of-the-art software, internationally top production lines and equipment, optimally coordinated processes and multiple safety systems. We offer a wide range of PCBs including all conventional PCB technologies and materials and all processing techniques, including protective coating and legend printing. Our services in terms of assembling comprise assembling of rigid and flexible PCBs, optionally with or without procurement of materials. The techniques used include THT (manually or automatic) as well as SMT and COB (Chip on Board). Over and above this, we also offer protective coating and other special services. Quality guaranteed by the wtronic Doublecheck is paramount in this respect, guaranteed through optical inspections, automatic optical inspections (AOI), functional test and In-Circuit Test (ICT). We also offer you the assembly of modules or complete devices as well as partial or pre-assemblies. Assembly with or without material procurement and potting in an enclosure are part of our range of services. For complete devices we offer functional tests and endurance testing as well as final testing. And finally, we can also deliver your product packaged including your required documentation, operating instructions, etc. With us, service is paramount. We offer a “Full Service” range of performance, based on Austrian quality management. Apart from full service procurement and full service production, we also advise our customers in the fields of process reliability, cost optimisation, certification and support programmes. Our common EDP system enables us to place orders on any of the works in any required quantity. Naturally always RoHS-compliant. We will organize optimal production based on the data you submit to us. This often starts with the development. We offer you an existing network of development facilities at our works or at external partner companies, including the following: Creating PCB layouts, compiling specifications, development of customized products, internal and external EMC measurements (CE certificate), prototype construction, transfer to manufacture. We offer a wide range of PCBs including all conventional PCB technologies and materials and all processing techniques. Our know-how, our procurement at day-to-day prices and our pool of specialists allow us to operate flexibly and independently, which manifests itself not only in cost-effectiveness but also in on-time delivery. Your wish is our command also in the assembling of PCBss. We offer expert assembling in any of the customary techniques. Our service includes also manual assembly and minimal quantities, including the production of prototypes. Top quality is guaranteed as always through our wtronic Doublecheck. We will accommodate you and your requirements in terms of assemblies also. We offer you assembly of modules and complete devices, including partial or pre-assemblies. Assembly with or without material procurement and potting in an enclosure are part of our range of services. For complete devices we offer functional tests and endurance testing as well as final testing. And finally, we can also deliver your product packaged including your required documentation, operating instructions, etc. With us, service is paramount. Because we consider ourselves more than just a producer, we are offering a “Full Service” range of performance, based on Austrian quality management. We can therefore advise you also on process reliability, cost optimisation, certification and support programmes. Smooth quality production must obviously be backed up by logistics. Our supply warehouse allows us to offer you just-in-time delivery. To support your cost-effectiveness, we also offer Kanban delivery and component warehousing, materials administration and consignment. 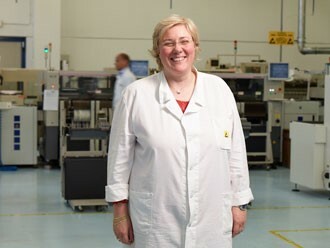 For commitment to be recognised as an indispensable added value to technical products, we need people who strive for top quality of service with competence and passion. The wtronic corporate culture is the epitome of just that and the result an above average team spirit. We are proud of every wtronic team member and every partner sharing with us this lofty ideal. Our team of committed staff is available to deal with all requirements, contributing their experience, expert know-how and personal dedication. The significance of PCB assembling increased considerably in the 1950s in the wake of mass production of radio and TV assemblies. This was driven by the automation of production steps. The assembled PCB had plated-through holes (PTH) and used THT (through-hole technology), which still required manual work. In the 1980s, after a further 30 years of development, the PCB industry had developed SMT (surface mounted technology), which now allowed fully automated assembling. Today’s manufacturing process essentially comprises four production steps. In the first step, the specified areas are fully automatically silk screen printed, using a special solder paste. A solder mask covering the areas that should not be soldered allows accurate application of the solder paste. The PCBs are assembled with their electronic components in the next step. Either SMT or THT may be used here to assemble the boards. SMT is used for assembling with components such as resistors, capacitors or microcontrollers, generally on the surface of the PCB. Components such as terminal strips, cables or already SMT assembled PCBs which require careful handling, are often assembled manually, using THT. The third production step is soldering of the components to the assembled PCB. The methods used are reflow soldering, vapour phase soldering and wave soldering. This is followed by panelisation, where a depaneling machine separates individual PCBs from a larger one. To ensure flawless operation, quality control subjects the assembled PCBs to an array of tests, such as automatic optical inspection (AOI) and an in-circuit test (ICT) or a functional test.